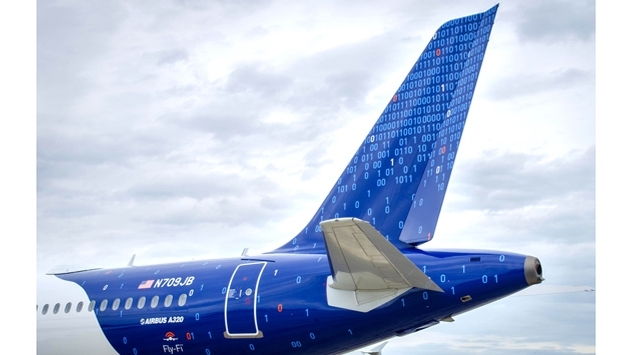 Award-winning JetBlue Airways introduced its newest custom livery, 'Binary Code,' to celebrate its Fly-Fi service, which delivers broadband Internet in the sky. 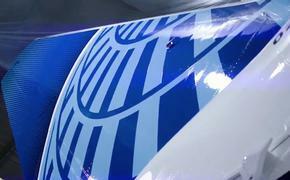 This one-of-a-kind livery joins JetBlue's fleet on the newly re-christened Airbus 320, "CONNECTED TO 01000010 01001100 01010101 01000101" (N709JB). "This beauty of a plane truly represents the pride we have in providing our game-changing Fly-Fi service," said Jamie Perry, director of product development at JetBlue. "We recently saw a record 136 connected devices on one of our flights — all enjoying a great high-speed connection. We've never seen anything like that from other inflight Wi-Fi products!" "It is great to see JetBlue showcasing its industry-leading internet product," said Glenn Latta, president of LiveTV. "JetBlue gave us the challenge of creating one of the industry's best Internet experience and we're proud to have delivered a solution that, combined with our live television offering, is a truly 'At Home in the Air' experience." "CONNECTED TO 01000010 01001100 01010101 01000101" rejoins JetBlue's fleet of 196 aircraft and can be spotted flying throughout JetBlue's route network, providing customers with the next generation of inflight Wi-Fi.